Researchers identify how the mammalian retina bypasses the body’s circadian clock. Most mammalian tissues contain autonomous circadian clocks that are synchronized by the suprachiasmatic nuclei (SCN) in the brain. The SCN clock itself is entrained by external light cycles through retinal rods, cones, and melanopsin (OPN4)-expressing, intrinsically photosensitive retinal ganglion cells. However, the retina does not follow this master clock, setting its own rhythms while sending the master clock the signals it needs to set the light-dark activity tempo for the rest of the body. The retina is the only tissue known to ignore the master clock, with researchers aware that its keep itself on a schedule and unaware how it does so. Now, a study from researchers at Johns Hopkins and the University of Washington has shown how the retina sets its own biological rhythm using a novel light-sensitive pigment called neuropsin. The team state that until now the global medical community only knew neuropsin existed in the mammalian genome and may help set the timing of reproduction for some birds; now they know what it does in mammals. The opensource study is published the journal Proceedings of the National Academy of Sciences. Previous studies show that neuropsin is one of seven related opsin proteins in mammals. Four enable the rod and cone cells of the retina to absorb light of different wavelengths and transmit that information to the brain so that the eye can see images. Another opsin, melanopsin, also absorbs light which it uses to guide processes like pupil constriction and circadian rhythms. It is found in nerve cells that connect the retina to the body’s master clock, the suprachiasmatic nuclei of the brain. On its own, this master clock tends to run slower than 24 hours in humans, and faster than 24 hours in mice, so it needs to be constantly reset to the light/dark environment by signals from the retina. In earlier work from the lab, circadian rhythms of genetically tweaked mice that were missing rod and cone cells and melanopsin were investigated. As expected, the circadian rhythms of these mice continued cycling and could no longer adapt to changes in light exposure. Surprisingly, though, the activity patterns of the retinas were still responsive to light changes, suggesting that there was another pigment in play. Suspecting one of the two opsin proteins with unknown functions, the researchers created two more types of mice, each one missing one of the opsin genes. 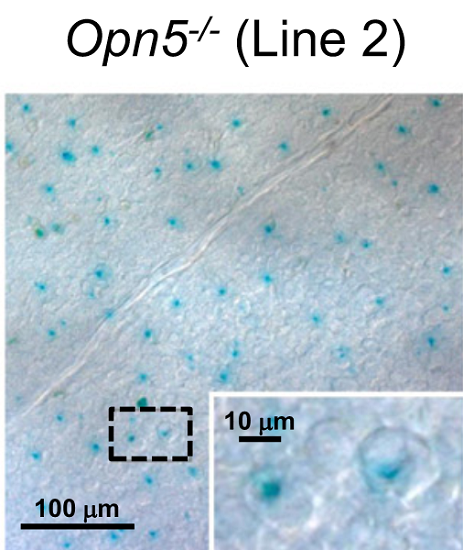 The current study showed that the retinas of mice without opsin 3 continued to be light-sensitive, however, their activity patterns were less robust. Results show that even with intact rods, cones and melanopsin, the retinas of the mice without neuropsin lost their ability to adapt to new patterns of light and darkness. By repeating their experiments with different wavelengths of light, the group found that neuropsin responds to UV-A and violet light. The lab explain that this means the retina uses separate light signals to set its own clock and that of the body’s master clock, the latter of which is set based on the blue/green light absorbed by melanopsin as well as blue through red light absorbed by the rods and cones. The group then used a specialized locator gene, called a reporter gene, to figure out where neuropsin does its work. Data findings show that, like melanopsin, it is located in neural cells that connect the retina to the brain, though where these particular cells go within the brain remains uncertain. The researchers note that they also found it in the cornea which was not thought to contain any pigments, as its job is to let light through to the rest of the eye. The team surmise that there is a lot of work left to do on this exciting finding. They go on to add that they don’t know what kind of signals, chemical or electrical, neuropsin uses to set the retina’s clock. For the future the researchers state they plan to investigate this and the role opsin 3 plays. Neuropsin (in blue) was found in nerve cells in the retina of a genetically engineered mouse. Credit: Wendy Yue, Johns Hopkins Medicine.